On a working day, towards Year close, did not follow this ODI no. 3941 played at Mohalli – though the 2nd match in the series did arouse some interest after the debacle at Dharamshala. Today, India won by 141 runs. Washington Sundar made his debut, Angello Mathews made a century; Dhawan made 68 and Shreyas Iyer made 88. ~ yet all that became insignificant !! ~ for long, my favourite question was on Belinda Clarke !! – not any longer !! Those of us following One dayers [in someways a misnomer for in 1983 WC, one match of 60 overs a side, stretched to 3 days and that way they were limited over matches and not one dayers !] and more specifically India’s fortunes, know the frustration too well, when Team India struggled to make team total of 200s and scores of 240 were considered ‘sure-win’ totals. On 18th Jun 1983, at Turnbridge Wells, with India reeling at 17/5, in walked Kapil Dev – scored the first century for India in ODI, an epic 175* (now do you when was the first century made in women ODI ?) .. .. we had to wait for more as Ravi Shastri made the 2nd ton playing against Australia at Indore in Oct 1984, Dilip Vengsarkar made 105 against England at Pune in Dec 1984; Shastri made another at Cuttack and then Krish Srikkanth made a flamboyant 102 off 104 balls against Australia at Jaipur in Sept 1986; a month later Raman Lamba made one at Rajkot. There were not many as each century was hailed a great knock ~ now there are 38 Indian batsman who have made centuries in One dayers with a total of 259 ! At Mohali, Shikhar Dhawan and Shreyas Iyer gave Rohit able company with rapid half-centuries, as India posted their 100th 300-plus total in ODIs. In the end, it actually was 8 short of 400. Angelo Mathews led Sri Lanka's losing battle with a fighting hundred, his second in ODIs, but just like AB de Villiers' 114 against India in Gwalior in 2010, it didn't take much away from a stunning double-hundred. So frenetic was the pace of the final third of Rohit's innings that he scored more than half of his unbeaten 208 in the last 10 overs. He had nudged his way to his 16th ODI century by the end of the 40th but went on to thump 107 more off his final 37 balls. 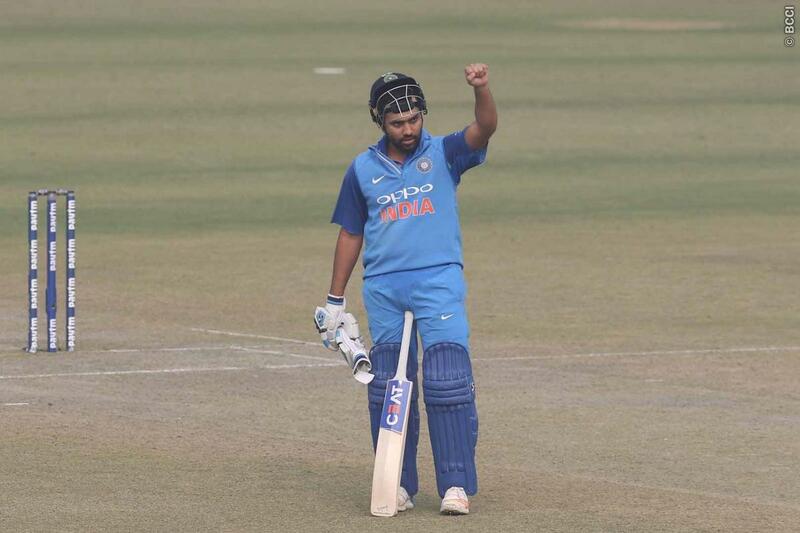 This 208 is the third of double-centuries for Rohit Sharma in ODIs. All other players have combined for only four double-hundreds. Sachin Tendulkar, Virender Sehwag, Chris Gayle and Martin Guptill have hit one double-century each. It was stunning assault as in 36 balls Rohit reached his 2nd hundred – he went from 116 to 208 off just 27 balls with 11 sixes (12 in all) and three fours. Tailpiece : 1) Aththachchi Nuwan Pradeep Roshan Fernando had the ignominy of joining the 100+ donor club as he had figures of 10-0-106-0. 2) would be a bit stale to restate that the first double century in ODI was hit by Australian Belinda Clarke way back in 1997; she made an unbeaten 229 at Mumbai against Denmark. 3) the first century in a Women ODI came in ODI no. 2 in June 1973. It was made by Lynne Thomas, soon to be followed in minutes by her partner Enid Bakewell as England made 258/1 in 60 overs.